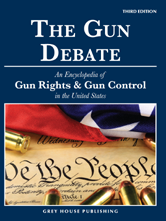 With public debate of gun violence at an all-time high, this new third edition of The Gun Debate: An Encyclopedia of Gun Control & Gun Rights is a must-have resource for all libraries. The 25 original documents in this section are arranged chronologically, and span more than 200 years. They include political debates, court cases, acts of law, and contemporary articles on both sides of gun control v. gun rights. They are designed to offer an historical reference point and broader understanding of the complicated issues that surround this ongoing debate.